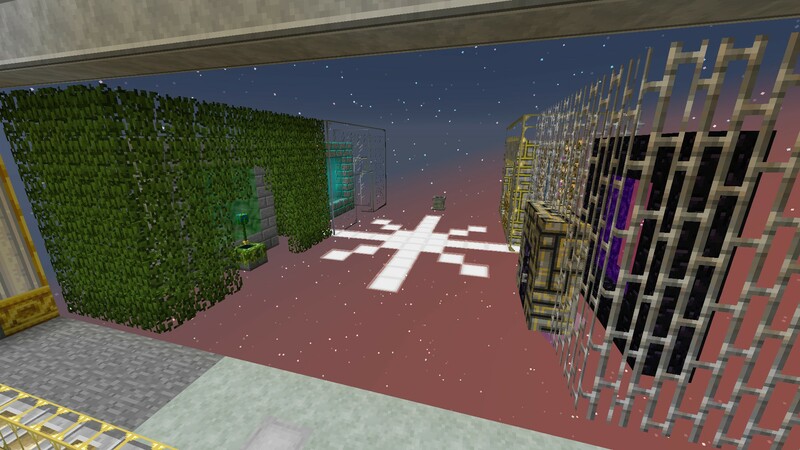 One of the ideas Froggy and Phenix had behind their community seed idea that they want to partially remake their viewer’s bases in their own world to show off. 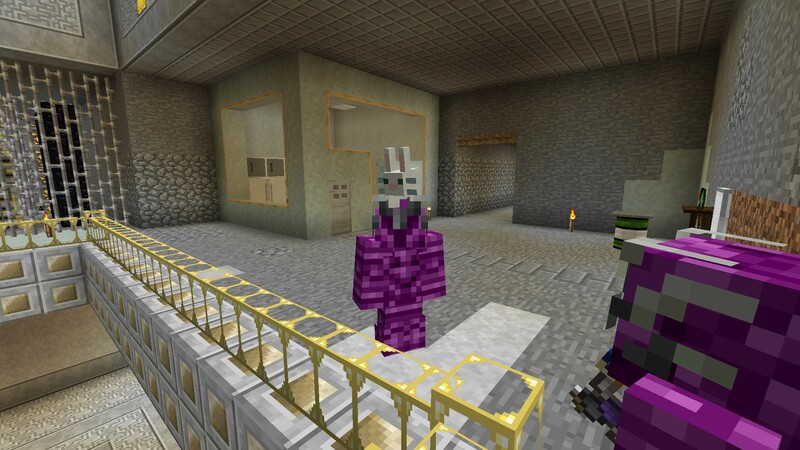 Since our base is rather large and already on a server, I invited them to come check it out themselves. I gave them a bit of a tour and when Froggy said she was measuring it out, I said they could just record a video here if they wanted to. Which is how just a day after my post, Froggy and Phenix posted a video where the first third was exploring some of our base. Like they mentioned in the video, I couldn’t hear what they were saying so I amused myself with trying to figure out what they were saying while they were jumping around and swinging their heads in all directions. I think I did pretty good because I only started jumping at the beginning there because it looked like Froggy was talking to me. Since that video was made, we’ve made a good bit of progress with the base. But, before I forget again, I finally have some screenshots from the other dimensions that Lord Crumb and I visited. First is Erebus. 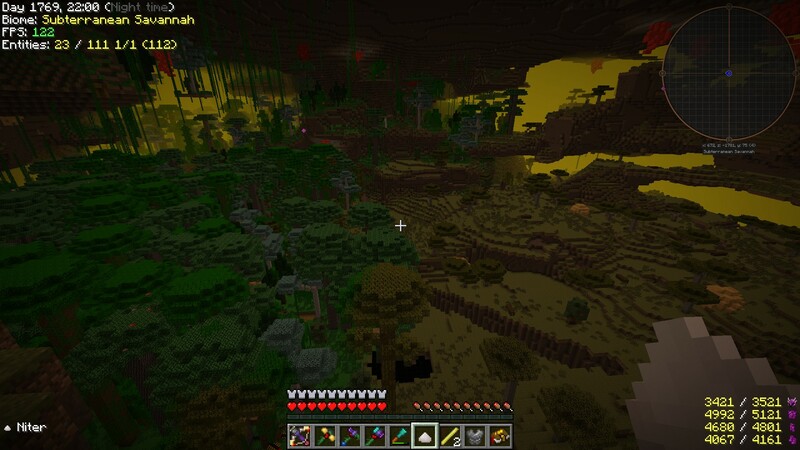 I mentioned before that there’s quite a few biomes for a dimension that’s entirely underground, like a jungle next to a savanna here. 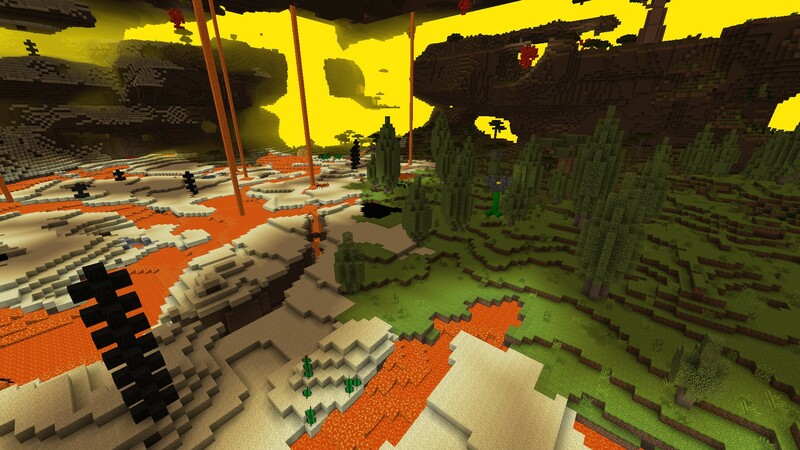 For an even more stark contrast, here’s a volcanic desert next to an Elysian field. 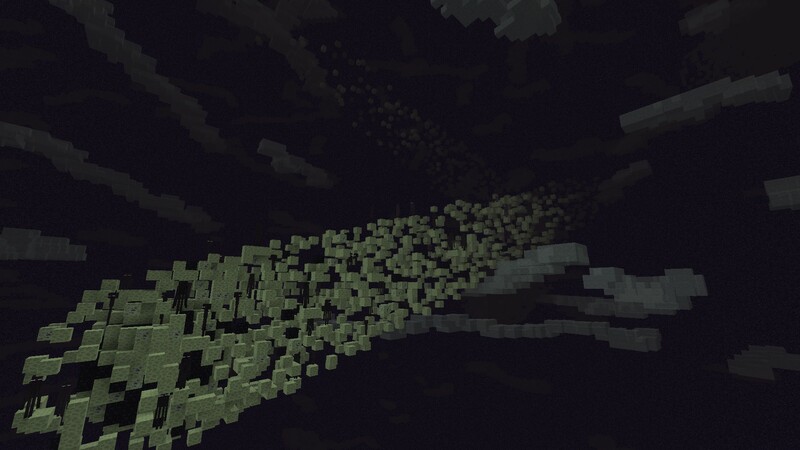 And here is the Aether, another dimension we visited that’s entirely made up of floating islands. 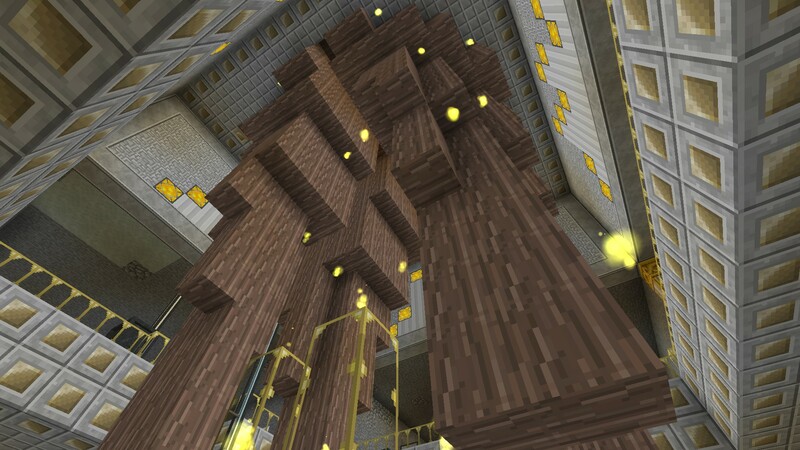 This dimension has its own variety of mobs just like Erebus. In the top center of the screenshot above, you see a Zephyr, which is entirely unrelated to my dog Zephyr. 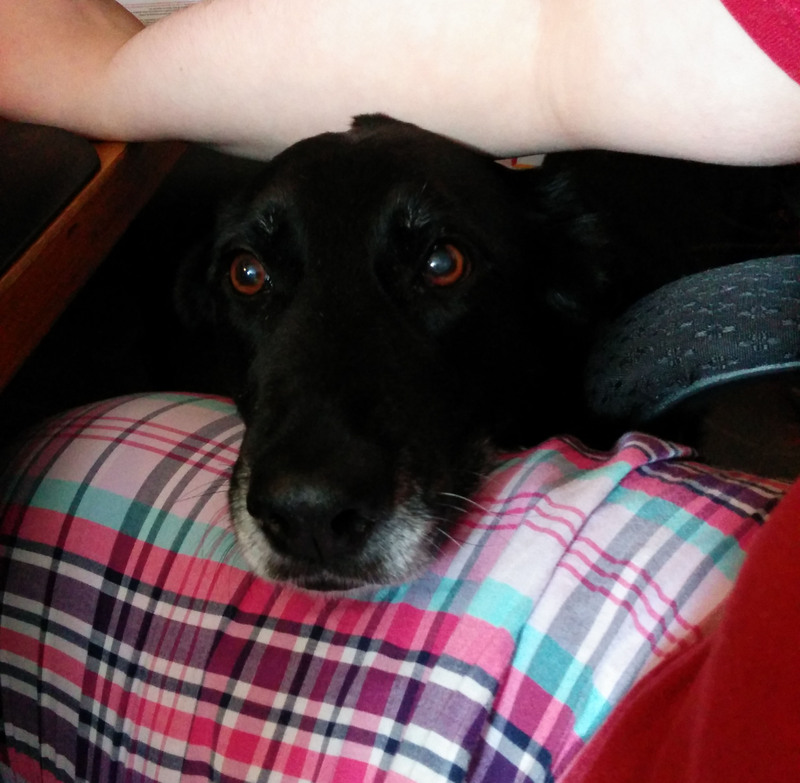 Zephyr mobs are aggressive and want to hurt you, while Zephyr dogs are only aggressive about getting pets. There are also strange passive creatures like a puffy aerbunny that you can pick up by putting it on your head. 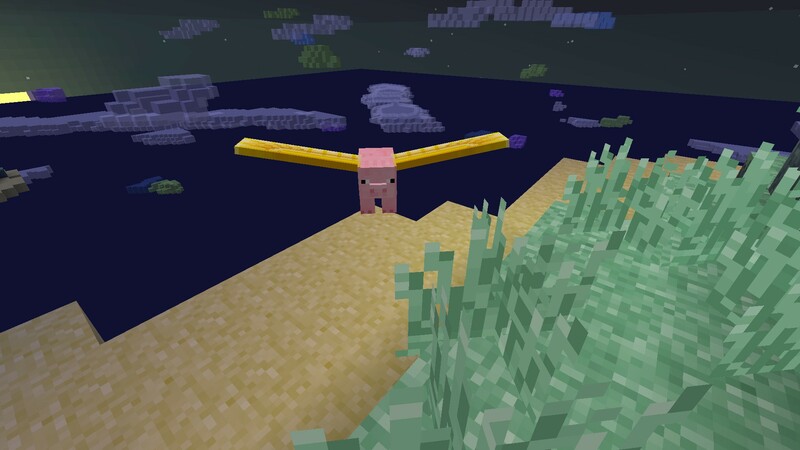 Indeed, there are even flying pigs called Phygs. Although they just more float slowly downwards as I discovered when a flying cow pushed both itself and a phyg off the edge of an island and I watched them slowly descend into the void below. Moving on to progression, we’ve opened two more portals since my last post. 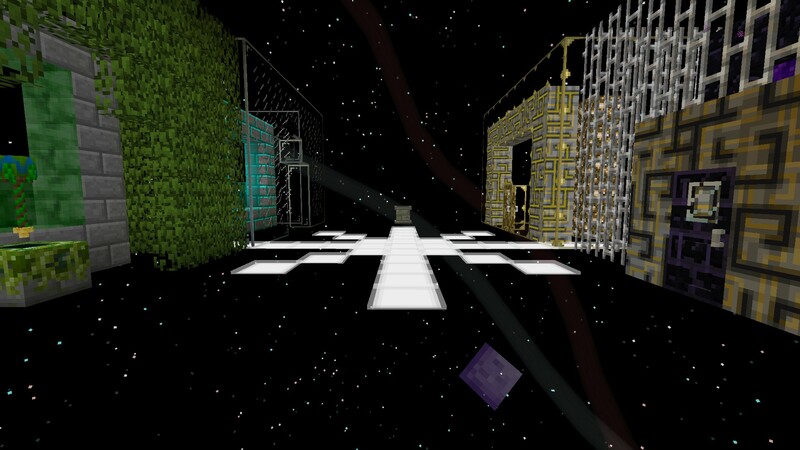 One was to Aroma1997’s Dimensional World AKA the mining dimension. The original purpose behind the mining world is…well, mining. It’s basically a flat, mostly featureless grass world where aggressive mobs are unable to spawn. And fallen skystone meteors that contains items needed to begin an ME system (more on that later). For us, the mining dimension is a great place for two things: finding fluid cows (although we have a lot already) and breaking chance cubes. Not only can we break the chance cubes we already have without worrying about any craters they’ll leave, there are also many that spawn naturally on the ground. We got a few interesting ones, including a horde of zombies that tried to murder Lord Crumb and ended up just burning to death. Another cube built a giant…whatever this thing is one layer at a time. 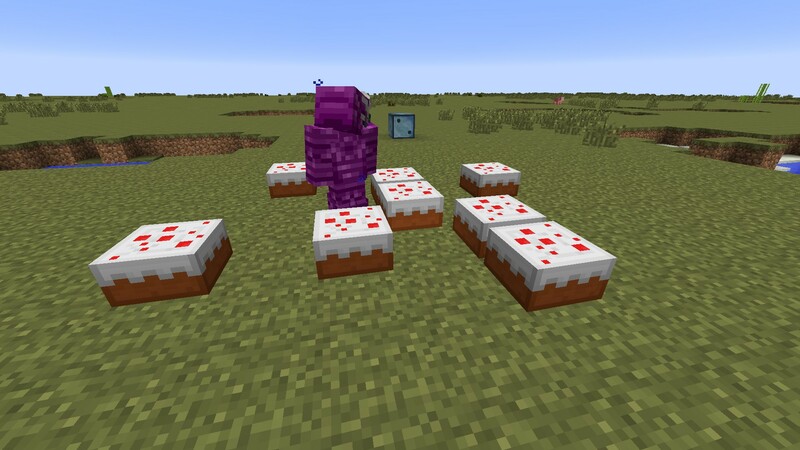 And in one of the towers, Lord Crumb found an artifact that spawns an infinite amount of cake. All in all, a very silly but fun trip. The second portal that we opened was the one leading to the End. 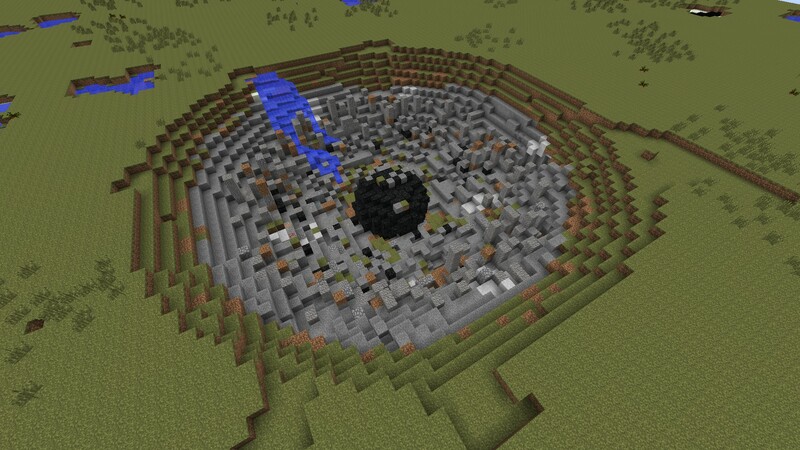 At first glance, there’s not much different about it compared to the vanilla enperience (an island built of end stone, many endermen, and the End dragon to kill and loot). But when I flew away from the island, I found came across what appears to be comets of obsidian and end stone frozen in time while they were hurtling through the End. Further on somewhere is another boss called a Chaos guardian that I’ve heard is the toughest in the game. We didn’t even attempt to kill it because I’ve seen unprepared people get one-shotted in let’s plays. Another major milestone we reached in our progression is the creation of an ME system. At first, it was nothing more than a few blocks in a quickly mined out stone room. Then I began decorating and went a little over the top with it. 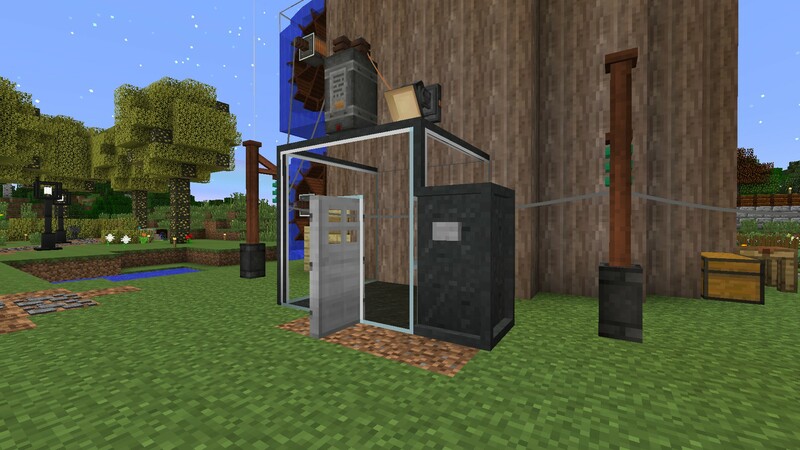 For those unfamiliar with an ME system (AKA AE system because the mod it’s from is Applied Energistics), it’s basically a modular crafting/storage system for Minecraft. 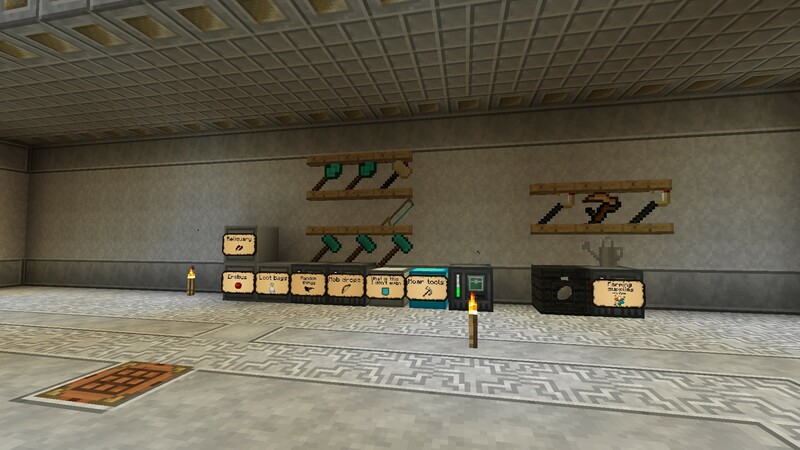 There’s all sorts of cables, buses, interfaces, crafting units and storage pieces that can be combined to streamline manual crafting, find items in storage easier, and to setup auto-crafting. I don’t want to go into great detail on how exactly it all works but let’s just say that it lets you do things like craft pistons without having to have the ingredients in your inventory because the ME system can pull the exact amounts from storage. 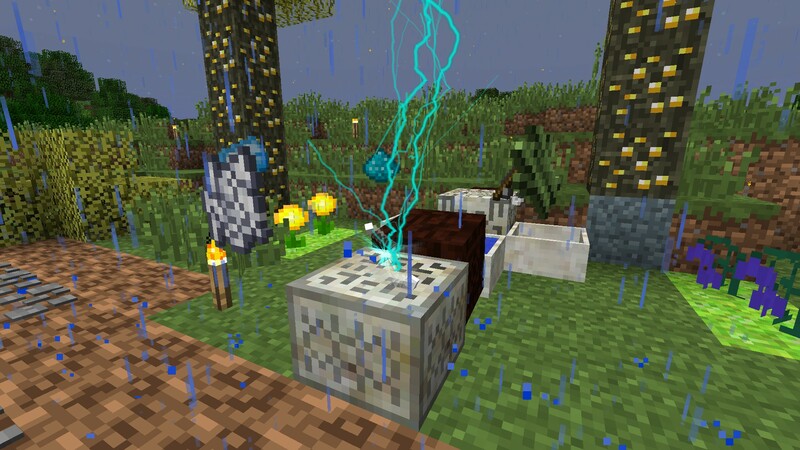 Or if you want to craft 100 chests but don’t want to sit there and make them yourself, you can ask the system to auto-craft them and go do something else while it’s working. 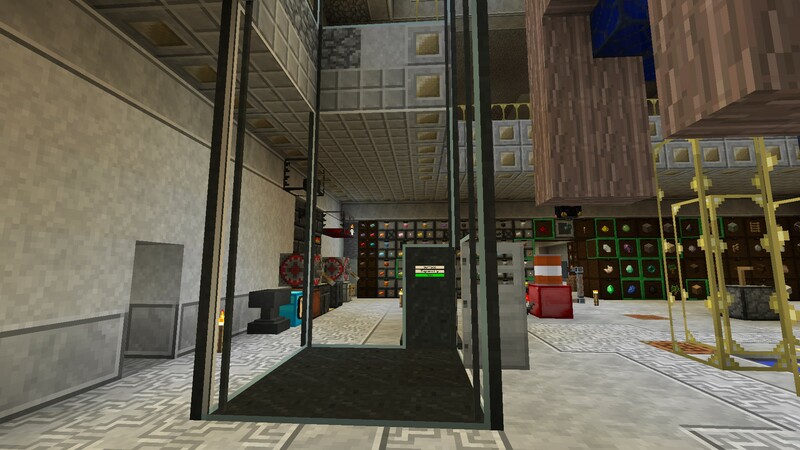 There are even wireless terminals so you can access all your items and craft from almost anywhere. 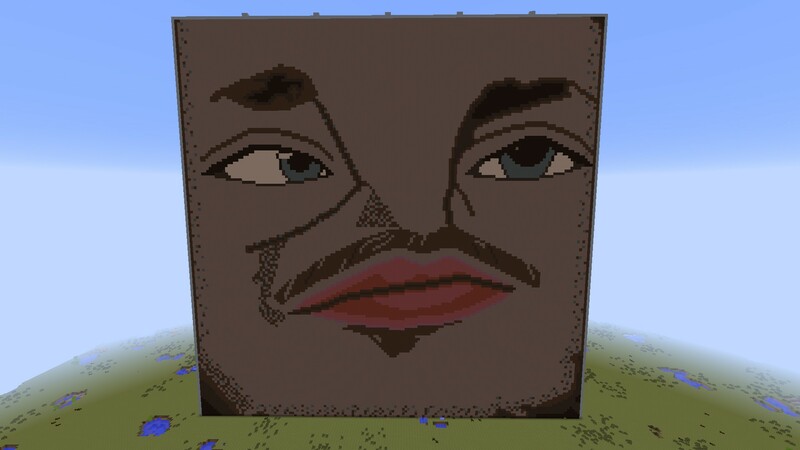 But anyways, back to decorating, the most important thing in Minecraft. 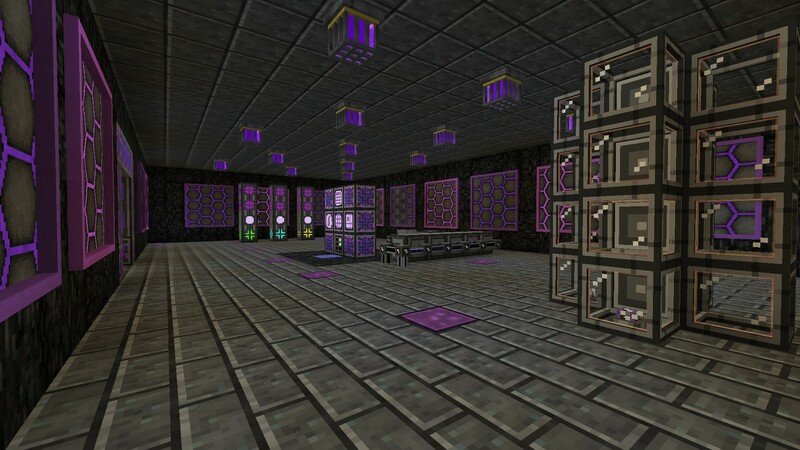 The whole idea for this room came from one style of block: the purple/magenta maze blocks. You see, ME controller blocks (the CPUs of the system) have the same maze design but flash through all of the colours of the rainbow (seen two screenshots up, it just happened to be on orange when I took the screenshot). I always loved the design but the flashing technicolours can be a little overwhelming. So when I saw a decorative block in the same style but with more subdued pulsing purple and magenta, I knew I had to use it to decorate the ME room. 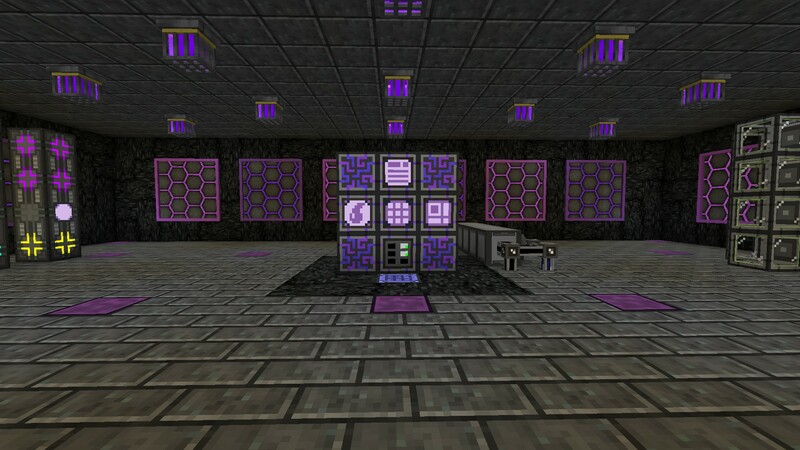 It was from there that I found the hexagonal purple and magenta blocks to make futuristic wall panels. Then the purple caged lights for the ceiling and magenta lights built into the floor. The black and grey blocks that provide a neutral background are various types of skystone, and skystone is one of the things needed to make an ME system so it worked out perfectly. As I said on Twitter before, I don’t even like purple and pink really, but I have to say I’m pretty happy with how this room came together. Rather than keep gushing about that, let’s move onto some other rooms that got decorated. When Froggy and Phenix made their video, I had just started on prettying up the walls and ceiling in the main lower basement area. This is how it looked once it was done. A lot of different kinds of white marble but I like that it’s a more subdued look. 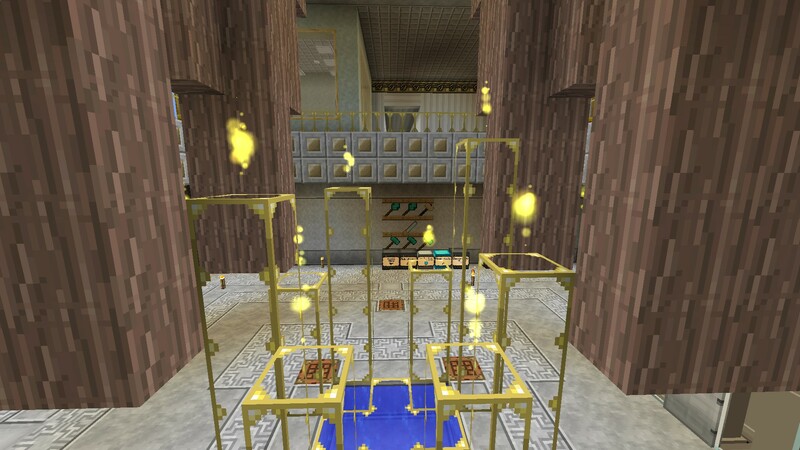 Up around the highest ceiling and the base of the roots, I used more marble and these really cool lamp blocks I found to make a pattern on all four walls. 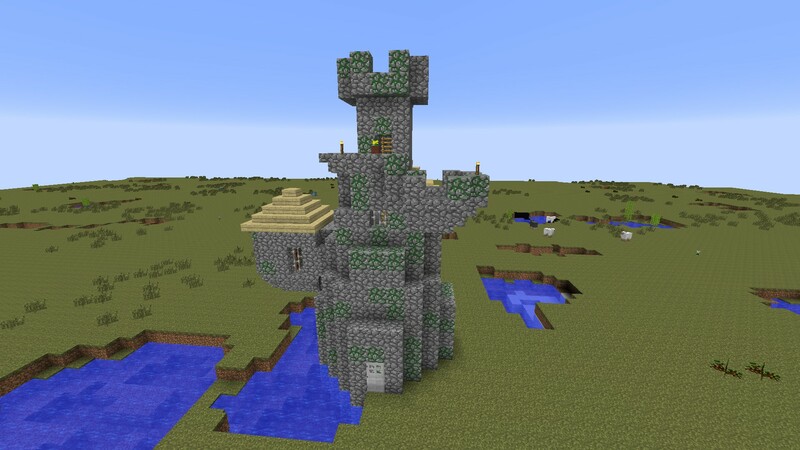 Lord Crumb didn’t play as much as I did (he’s actually playing other games in his solo time) but he still did a wonderful job of replacing the viaduct with a PneumaticCraft elevator and closing it in glass and basalt. 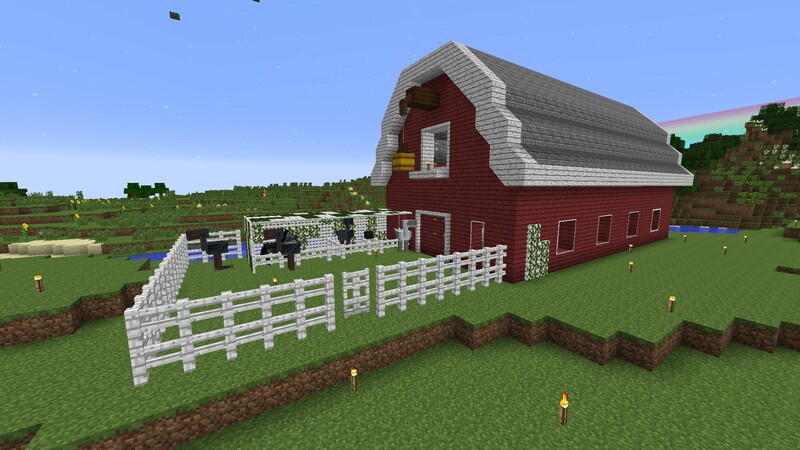 Up on the surface, I built an good old red barn to house our various animals. 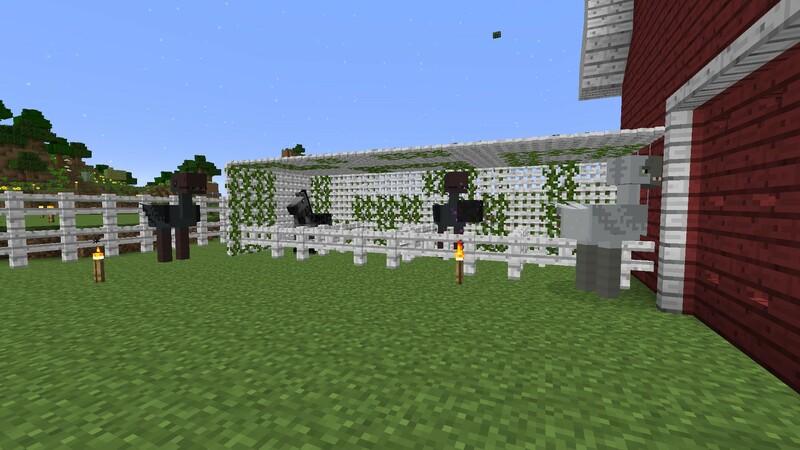 The paddock and vine-covered stable out front is for horses and moas, large birds from the Aether that you can ride and are capable of gliding and jumping several times in the air. 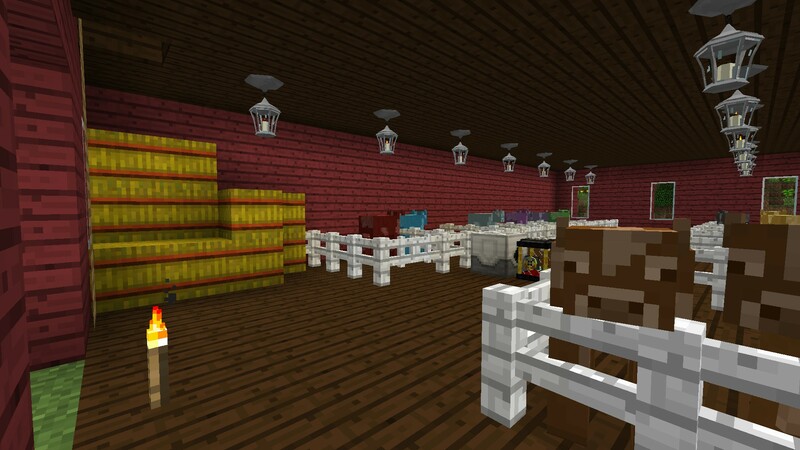 Inside are two floors of pens holding our various fluid cows. The Botania area next to the barn finally got some attention, although not of the decorating type. Instead I learned how to make runes on the runic altar and completed a few quests. Well, I may not have done any more decorating in the area, but it was tangentially related. I needed some runes to make a mana blaster, a Botania gun that can do a variety of things depending on the type of mana lens inside it. 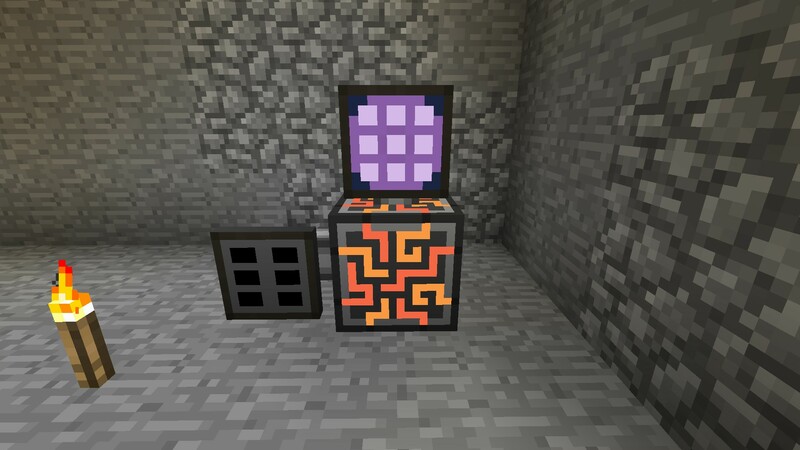 The mana lens I put in it makes it shoot mana flashes, coloured light sources that attach to any surface and look like mystical flames or will-o-wisps. 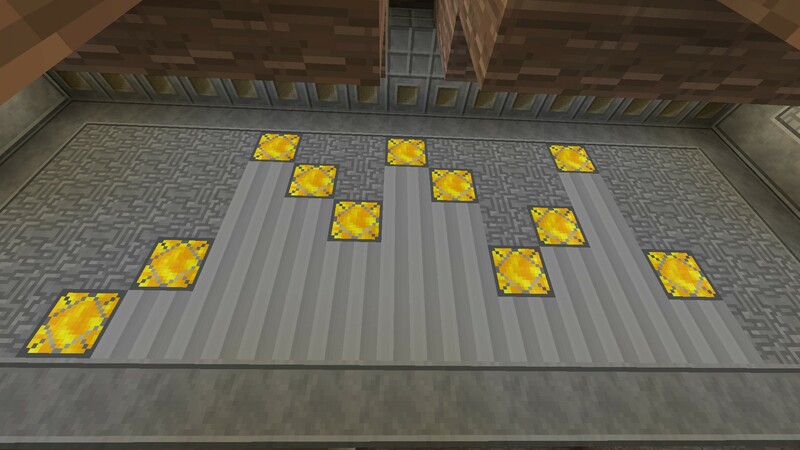 At first I just put them on the glowstone crystals in the lower basement. Then I realized they would be perfect for adding a magical vibe to the redwood roots coming down from the ceiling. 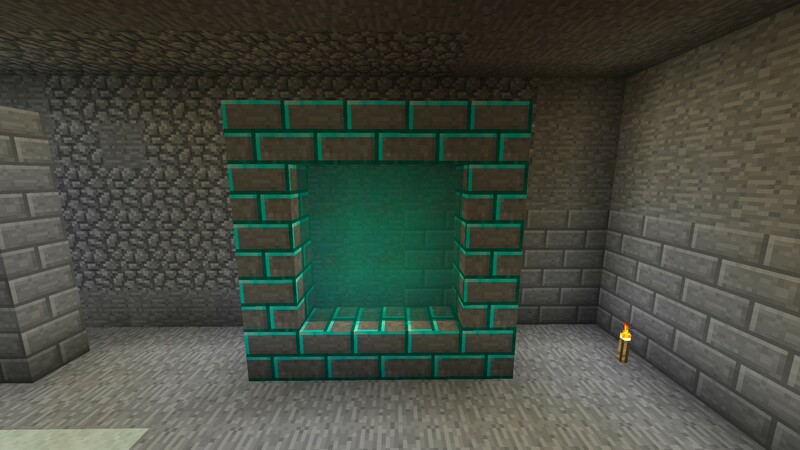 And last but certainly not least, I finally decided on how I wanted to decorate the portal room after much waffling. Contrary to what you see, I did not relocate the portal room to be in orbit. What you see are a whole lot of Sky Blocks, which do exactly what their name says: they match what you’d see in the sky box if you were outside. And they do indeed change depending on the time of day. 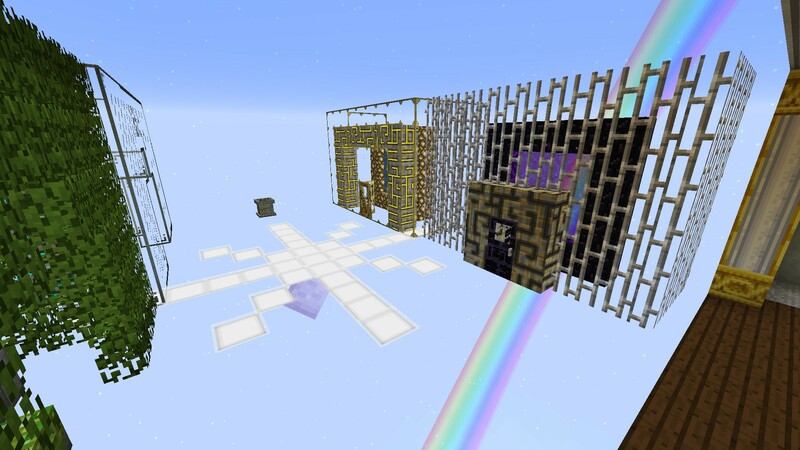 I love how it makes the portal room look like it itself is a portal to another dimension. It’s a really cool and pretty effect. I can’t take credit for coming up with the idea though. Froggy and Phenix showed it in another of their videos and as soon as I saw it, I knew what it would be perfect for.